That is what a person who has lost all his data must right be called. My dear 250GB hard disk at home got fully erased a couple of weeks back. Initially I couldn't handle the shock well,but in half an hour I managed to estimate the extent of damage and started inquiring with my friends about recovery mechanisms as well as availability of some of the data that I had. Most of them comforted me by ensuring that its just a matter of recovery. So,this time when I was at home, I tried a pack of recovery tools on my disk,to no avail.All I managed to recover were a few random songs and some college photos. By now I have resigned to the fact that I won't get all those data back very easily. And I have started planning on how to reclaim majority of those data. Softwares,games,movies and majority of the songs are available with the common market(i.e the average commoner also has). For the specific and rare ones, I might have to go visiting some old friends. Still there would remain a bulk of data that only I held. Those, I would either have to recreate or redownload if necessary/possible. Some(especially programs and ebooks),I have brought alongwith me to Mysore,making them the sole survivors of the loss. Anyway,there would still be many such items which are never replaceable,the loss of which I have to accept. 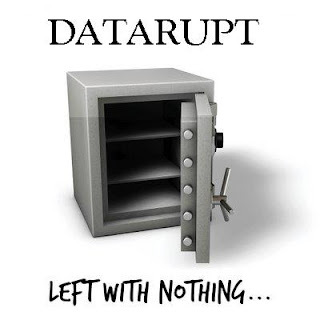 So anyone who wishes to contact me for any data,please know I am legally 'Datarupt'.